Jonathan Miller, Dudley Moore, Alan Bennett and Peter Cook: are the names familiar? They should be. 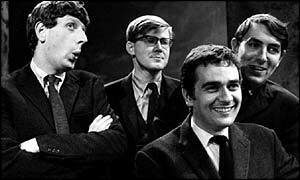 These four remarkable young men were the creators in the 1960s of the wildly popular comedy show, Beyond the Fringe. While still students at Oxford and Cambridge, Dudley, Alan, Jonathan, and Peter put together a comedy revue that first saw the light of day as an adjunct to the Edinburgh Festival. The festival had a “fringe” beyond the big-name events, but this little production went “beyond” that – hence, its title. I remember hearing Beyond the Fringe for the first time on an LP in the early 1960s. Hysterically funny – especially to those of us who, like the characters in the show, were undergraduates at the time. Recently, upon reading that Jonathan Miller is currently directing a new production of La Bohème at the English National Opera, I was inspired to investigate what, if anything, had survived of the early work of these four multi-talented performers who eventually went their separate ways to make their marks in Hollywood, television, literature and opera. Beyond the Fringe was so successful, that it quickly moved from Edinburgh to London and then to New York. The last performance, recorded live by Thames Television, is now available on DVD. I found the comedy still engaging, but it has lost its edge, dulled by the even more pointed satire that followed it. The DVD does serve as a valuable record, however, of how these quintessential comedians began their careers. Many of the classic bits are there: Alan Bennett doing his Anglican minister send-up – “My brother Esau is an hairy man and I am a smooth man”; Miller and Cook doing their philosophy professor reductio ad absurdum; and most memorable of all, the brilliant musical takeoffs by Dudley Moore. In one of these, Moore improvises a Beethoven-like sonata that can’t seem to find an ending. In another he adopts a falsetto to mimic Peter Pears performing some sort of ludicrous Britten folk-song arrangement. In still another, he gives us the little-known German lied Die Flabbergast which comes across as Fischer-Dieskau on LSD singing Schubert’s Erlkönig. Beyond the Fringe managed to be sophisticated, intellectual, and slap-stick - all at once. Jonathan Miller had trained as a medical doctor. He went on to produce and host numerous documentaries on medicine and to direct opera. His remarkably innovative production of Rigoletto remains a classic of its kind. In moving the setting of the opera from Mantua in the 1500s to 'Little Italy' in 20th century New York, Miller made the work fresh and powerful all over again. In replacing a cast of courtiers with Mafia figures, he created an operatic counterpart to The Godfather. Fortunately, Miller’s production has been preserved on a film from 1983, now available on DVD. Alan Bennett became a successful playwright, most recently with The History Boys, which was seen on both stage and screen. Peter Cook was generally acknowledged to be a comic genius and starred in numerous British television series. Cook and Dudley Moore made several LPs as Derek and Clive that contained skits of such foul-mouthed absurdity they can only be described as being “beyond the pale.” X-rated Harold Pinter, perhaps. It is a wonder that their careers survived these performances. The biggest commercial success was achieved by Dudley Moore. Very early on, he made a name for himself as a jazz pianist and for being able to parody all manner of classical performers and styles. Peter Cook was renowned and feared for his put-downs, and once said of his friend ‘Dud’: “He’s a club-footed dwarf whose only talent is being able to play 'Chopsticks' in the style of Debussy.” Dudley moved on to flourish in a BBC television series with Cook – Not Only…But Also - but his big break came in 1978, when he starred in the film Foul Play with Goldie Hawn and Chevy Chase, and the following year with Bo Derek in 10. He was now a Hollywood star and soon rose even higher with the film Arthur, playing alongside Liza Minnelli and John Gielgud. For the next ten years he went from one film success to another. The piano, however, remained Moore’s first love; he ultimately returned to it, playing jazz, and performing concertos with symphony orchestras. One of his most important projects was Orchestra!, a collaboration with Sir Georg Solti. This was a 1991 television series designed to introduce general audiences to the symphony orchestra. In Orchestra!, Solti conducted the Schleswig-Holstein Festival Orchestra and Moore appeared as piano soloist and harpsichordist. The two even played some four-hand music together. The glue that held the show together was the repartee between Solti and Moore. As a big Hollywood star, Dudley Moore captured the audience and kept it entertained while enabling the celebrated maestro Solti to bring the great symphonic classics into focus. Moore returned to this format in 1993 – this time with conductor Michael Tilson Thomas – in a highly-regarded series called Concerto! Dudley Moore’s career began to fade in the early 1990s, and it only became apparent later that he had begun to be incapacitated by the disease that ultimately killed him. He was suffering from the terminal degenerative brain disorder, Progressive Supranuclear Palsy. In its early stages the disease made it difficult for him to remember lines or music, and later, he could neither play the piano nor speak with his accustomed fluency. People who didn’t know Moore attributed his problems to alcohol abuse, but the fact is he didn’t drink at all, except in the movies. His last years were rendered more tolerable through his association with pianist and music critic, Rena Fruchter. Fruchter was married, but she invited the ailing Moore to move in with her family in New Jersey. When that arrangement became too difficult, she set him up in a house next door. He died at the age of 66 (March 27, 2002), holding Fruchter’s hand. Fruchter’s book, Dudley Moore (Ebury Press, 2004) remains the definitive biography on this gifted pianist/comedian. Always good to see Dudley Moore getting some credit. In the UK he always seems to be regarded as someone who was lucky to fall in with the right crowd, which I've always thought was a hugely unfair assessment. For anyone interested in the history of "Beyond the Fringe", I've been putting together a little site telling the whole story and it can be found at 1hw.org/beyond - it's still a work in progress, but I'm quite pleased with it so far!